I'm having a hard time with the idea that they're actually hard to find now... I still see them pretty regularly. Some thoughts on 4 piece bars. Was that written by you? also, why have I not seen anybody else mention mat breaking his old height record, on a 30ft ramp, in 2015? ...I started playing around on Big Ramps again. I rode one in March at the Old School get together at Woodward West in Tehachapi, CA. I was pushing 20 feet comfortably and felt I could go higher than I had before. There were a lot of people around and I knew I needed to do this just for myself to get the focus needed. I had been in the ER many times recently, so I second-guessed myself and walked away to prove I could and to give it more consideration. It kept burning bright, so I decided it’s in me and I had to let it come out. I’ve been riding a lot but also flying wingsuits, which I think has helped me cross train by harnessing aggressive energy better, become one with it and flow, like the big ramp demands. Painting more has helped sharpen my focus too, plus I’m 43 years old (the holy grail of BMX or so we claim), so I decided I was mentally ready to take on the challenge. Danny Way talked to me earlier in 2015 about designing a ramp to get more air. He wanted to go so high nobody would want to step to it. So he built this ramp (30 feet tall), kept it a secret and was ready to test it out this past May. At the same time, I had committed to push my limits on these big ramps again too, so the timing was perfect… he invited me out for the test ride. I went out there and had a private session. I set up some unmanned cameras and filmed the whole session(s), which I’ll show later this year. I was able to break my past record. This sketchy pic was one I shot of a camera screen from one of Danny’s friends who captured it at my first session. It’s definitely not print quality but I liked how the style was so much like the original air I did on my original Big Air ramp in 1991, but higher. It’s now been 25 years since I made a bike I could trust my life with going bigger than ever before. Let my life be an example to never give up, follow your heart and do what you want no matter how many times you’ve been knocked down and people tell you you’re crazy or it’s impossible. Keep getting up and keep your dreams alive. Keep your game true to your heart and push your life’s passions and skills, no matter how ridiculous they may seem to others. Always following your dreams to wherever they lead…. Love Life and make your dreams happen, no matter what! 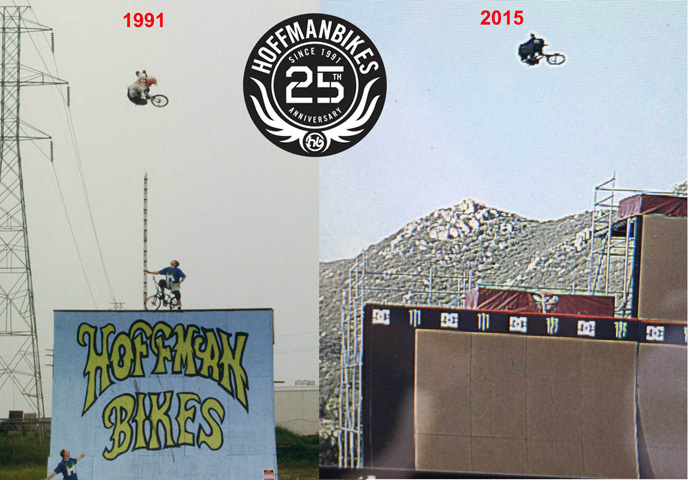 This is what 25 years of Hoffman Bikes is about to me. I was 18 when I set my first high air record. I had to build a bike I could trust my life with to achieve this. Now I’m 43 and I still make a bike that can back my dreams no matter how big they go….